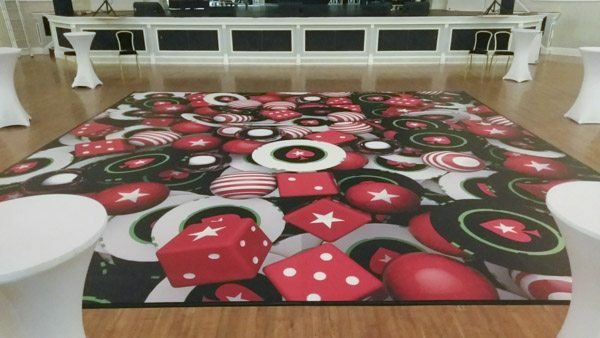 Printed Floor revives the ‘wow’ for online poker event. Many of us have been to events which aim to give that wow factor. The events that have a little something to make sure they go unforgotten. With lasers, live flames, interactive projection and lighting often the norm these days, what do you propose to a high profile client to revive that wow experience, and help make something unforgettable once again. For Event Lighting Services’ Justin McMullin, it was very much a light bulb moment when he was casually browsing through a Le Mark email promotion about custom printed dance floors. 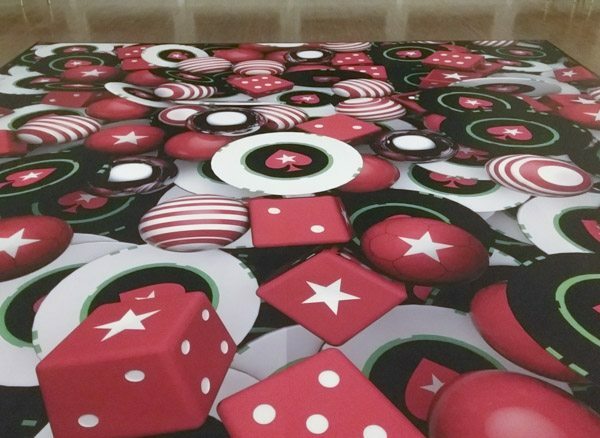 IMAGINE THIS: Creating a scene for an Online Poker client, where their guests could walk into a room, over a floor that’s been custom printed with a high-resolution design covered in poker chips, dice and poker themed styling. All in stunning high-resolution. Well that’s exactly what they did. “The printed dance floor looked amazing. Hats off to Le Mark for doing it with such short notice and then managing to get it shipped all the way to our little rock in the middle of the Irish Sea all in good time for the client who was blown away with the finished article. It was certainly a great centrepiece and a talking point”.